MiniCap is a portable screen capture tool which supports command line functions. It is able to launch applications, take a snapshot of the graphical output and then terminate it again upon completion of the screenshot. Other features include the ability to capture screenshots of applications based on a variety of criteria including the application name, the PID or the handle. 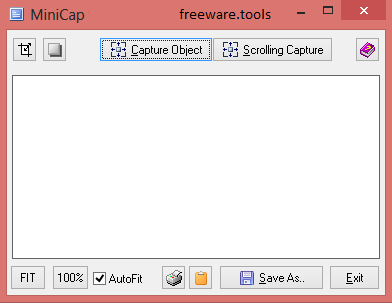 MiniCap can also capture the contents of scrolling windows and features a lot of the technology used in other applications developed by DonationCoder like Screenshot Captor. No installation required to use this tool. MiniCap is a lightweight and very efficient piece of software created to offer you the possibility of grabbing screenshots using command-line arguments or the minimalistic graphical users interface that it features. Being a standalone tool, installation is not a prerequisite, which means that you can just decompress the archive and run the executable to get started, or launch it from CMD. Consequently, this translates into the ability to work with Portable MiniCap on all compatible systems, from a removable memory device, without a trace on the host computer. The GUI enables you to take snapshots of a specific object or of a selected area, just by hovering your mouse cursor over the targeted item and pressing the CTRL key while clicking your mouse. The grabbed files can be saved to a user-defined destination folder, to GIF, TIF, PCX, PNG, BMP, JP2 or PDF. The command-line usage of Portable MiniCap, however, comprises a much wider functionality, being fully detailed in the 'Help' document. It thus allows you not only to snap images of your screen, but also run an application and capture its window or an indicated region, or compress the generated picture. Moreover, the command-line arguments enable you to copy an image to your clipboard immediately after capture, add a border to it or resize its width and height. The picture can be converted to Black&White, you can remove or flatten the aero mode from Vista and Windows 7 systems, as well as insert Exif comments into the saved file. To conclude, Portable MiniCap is a useful and reliable program that can successfully assist individuals of varying levels of experience in grabbing screenshots, resorting either to the basic GUI of the tool or to the more demanding command-line interface.